I am definitely a breakfast person. Some are, some aren’t. I am! I can eat a hearty breakfast and then not eat all day. I love a sweet, salty mix like bacon or sausage and waffles, pancakes or french toast drenched in sweet maple syrup *drool. I enjoy it even more this time of year. There’s a chill in the air and I want to fill my belly then lounge around and watch the leaves fall. It never happens like that, but that’s the dream. But as you know, I have been dieting and that breakfast is kind of off limits right now. Final weigh in on Tuesday. *gulp*. So, I am trying to eat better. Fewer grains, better carbs, no processed foods and a lot more protein and healthy fats. I saw this recipe on The Pioneer Woman and it looked so very yummy. It wasn’t complicated and it didn’t look too time consuming, so last night I chopped up the veggies and stuck them in the fridge and this morning I cooked this up in a matter of minutes. I’ve got to say, this was an amazing way to start my day. It tasted delicious and sustained me until lunchtime without any grumblings. It was so good I may make it again tomorrow. And possibly every day after that. This would work with any of your favorite veggies and cheeses, I’m sure. But here is what I used. This is a must try, whether you are trying to lose weight or just eat healthier. 3. In a medium skilled heat olive oil and onions. Cook for about 3-4 minutes then add squashes. Continue to cook an additional 5-6 minutes, while poaching your egg. Add the spinach last and stir it into the hot veggies to wilt. 4. 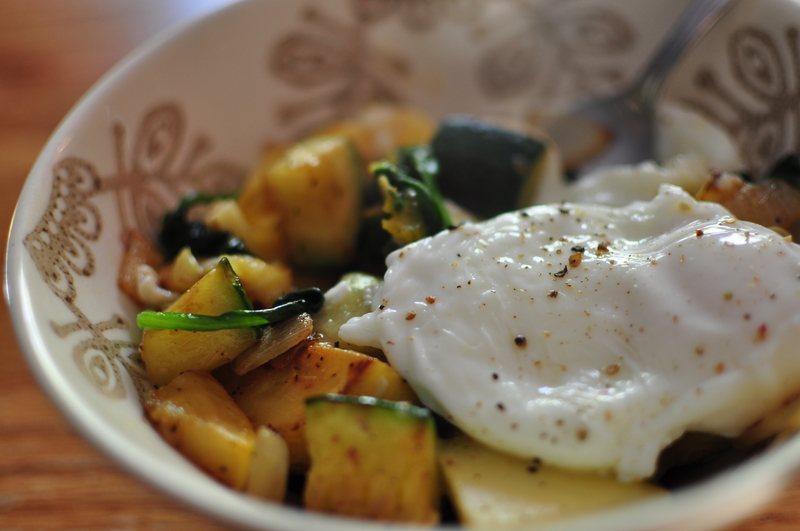 Place veggies in a bowl, sprinkle with cheese and top with your poached egg. 5. Let sit for a minute so all the heat from the egg and veggies to melt the cheese. Sprinkle with salt and pepper and enjoy! I love an interesting breakfast…especially one with cheese. I just made and posted about a breakfast quesadilla that made my heart and tummy sing. Nice post!